Recorded in the spellings of Horsfield and Horsefield, this is an English residential surname which seems, at first glance, to be quite straight forward. It appears to describe a person who lived by fields used by horses or more likely from a village of the same name. 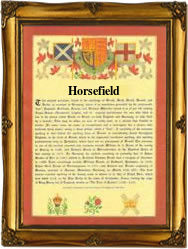 The problem is that there is no such place as Horsefield or Horsfield, and logically it is very unlikely that land would be kept specifically for horses unless it was either a race course, or a stud. Even then the land would, almost certainly, have been used for other animals in the grazing cycle practised since time immemorial. An alternative suggestion which has much merit is that the name relates to a now 'lost' medieval village or possibly villages. Over five thousand British surnames are believed to originate from places, whose only memory today lies in the surviving surname. This may well be one of them. Canon Charles Bardsley, the famous Victorian etymologist suggested that the name was from the north of England, and thought that it might have been from Yorkshire, as he was certain that it was not from Lancashire. It seems however that the name is quite rare wherever it is found, there were only eight recordings in Lancashire and six in Yorkshire in the year 1880, and even fewer in London. These London records may however hold a clue to the name origin as the first known recording may be that of William Horsefold, as spelt, at the famous church of St James Clerkenwell, in 1596. Was a Horsfield originally a Horsefold? We do not know, but certainly in 1795 there was no argument, Elizabeth Horsefield marrying a Richard Thornton at St Georges Chapel, Hanover Square, London, in that year.